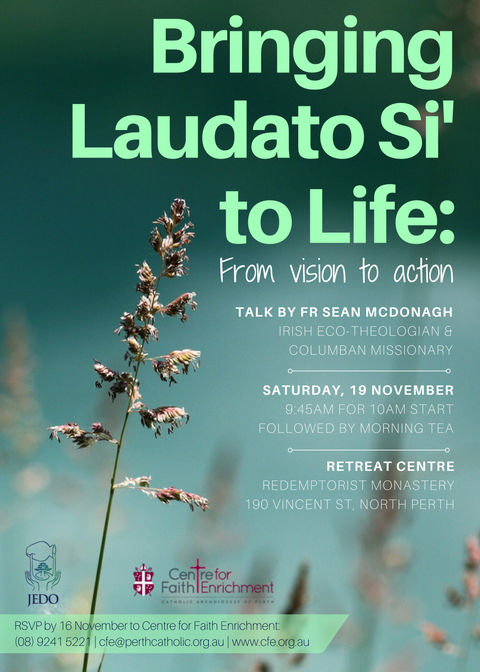 JEDO and the Centre for Faith Enrichment invite you to join us at “Bringing Laudato Si’ to Life: From Vision to Action,” a talk by Fr Sean McDonagh, Irish Eco-theologian and Columban Missionary. Fr Sean will be in Perth this November, and will be giving this talk at the Redemptorist Monastery in North Perth on Saturday 19th November. The flyer can be downloaded below, and has the full details of this event. Please let us know whether you will be attending by sending your RSVP to the CFE by 16 November, on 9241 5221, cfe@perthcatholic.org.au or www.cfe.org.au.